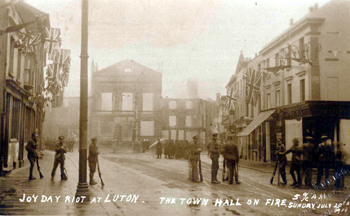 The history of the riots which flared up in Luton. Ex-servicemen and their families, angered by extravagant publicly-funded victory celebrations while they were unemployed and poor, took to the streets in protest. In the summer of 1919, as the local Council launched extravagant celebrations of the war’s end, angry ex-servicemen demanding work took to the streets. How one interprets the mutinies of World War I depends on one's attitude to social change. If one is looking for a centralised overall strategy, one will only see a series of eruptions flaring up and dying out, some achieving their objective, others ending in failure. A mutiny may be defeated, or fragmented by demobilisation, but the participants live on, learn lessons and pass what they have learned on to others. Mutinies can only be understood as part of a wider movement of social upheaval, a movement which may include police as well as army and industry. It is a mistake to draw strict distinctions between military disturbances and other forms of social protest. A mutineer might cease to be a mutineer on the day he ceases to be a member of the armed forces. But he does not thereby cease to be a political animal nor will he forget the ties of comradeship forged during his fight with the military authorities. This account was drawn from 'The Luton Riots : A Reconstruction of the Events', a recording made by Mr Ron Hall, reproduced by Bedfordshire County Library from a copy in the possession of Dr D.H. Shaw.